If economic growth is sustained and there are ambitious strategic plans in place, the two weaknesses of the current process of change are in the environment and the autonomy of social movements. For Sivak, it was almost impossible for Evo not to win, so the 61% of the vote reaped by the Evo Morales-Álvaro García Linera ticket was not surprising. “Living conditions considerably improved, there were social investments and investments in infrastructure, economic development was prioritized above Mother Earth, and changes have not been as radical as initially thought,” he qualifies. Contrary to appearances, Sivak notes, there were more continuities than thought to be possible in those eight years. For example, “under the Evo government, 50 people died in protests,” not always attributable to direct repression. Furthermore, “the economic right lost a lot of money because it pays more taxes, but they weren’t expropriated.” These are nuances between the new, which actually is not so new, and the old, which has more life than you could imagine. If economic growth is sustained and there are ambitious strategic plans in place, the two weaknesses of the current process of change are in the environment and the autonomy of social movements. When the MAS tenure began, the Unity Pact between major peasant and indigenous organizations–who were the foundation of MAS support–was reached. 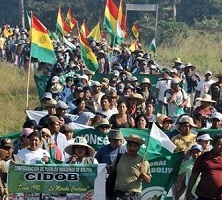 It included the United Syndical Confederation of Campesino Workers of Bolivia (Confederación Sindical Única de Trabajadores Campesinos de Bolivia, CSUTCB), the National Council of Ayllus and Marcas of Qullasuyu (Consejo Nacional de Ayllus y Marcas del Qullasuyu, CONAMAQ), Confederation of Indigenous Peoples of Eastern Bolivia (Confederación de Pueblos Indígenas del Oriente de Bolivia, CIDOB), and the Bartolina Sisa National Federation of Indigenous Campesinas in Bolivia (Federación Nacional de Mujeres Campesinas Indígenas Originarias de Bolivia “Bartolina Sisa”), among others. Since that moment, the Evo Morales government has aimed to neutralize the two principal social organizations critical of its change process. Cancio Rojas, CONAMAQ leader, says his organization suffered a “coup” as a result of government intervention. Rojas was at the 4th Seminar for the Integration of Latin America From Below, held in Cochabamba, November 4-5.11 In effect, the two organizations went through similar situations. 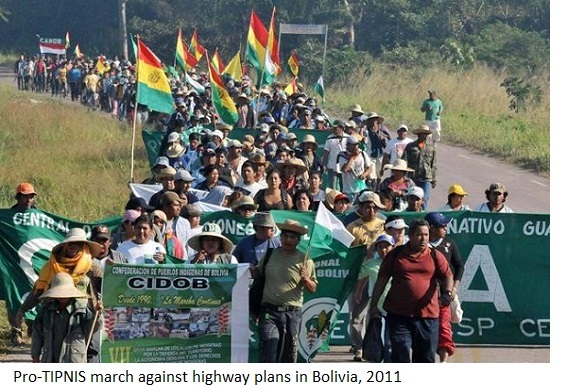 In June 2012, CIDOB denounced “government interference, with the sole purpose of manipulating, dividing, and influencing the functional and representative bodies of the indigenous peoples of Bolivia.”12 A group of dissidents with government support disclaimed the authorities and called an “extended commission” to elect new ones. Based on this reality of state offensives against social movements, which is evident in Bolivia as well as Ecuador and Venezuela, a debate was opened at the Seminar on the type of relationships to maintain with institutions and with international cooperation. Cancio Rojas and Carlos Mamani, both from CONAMAQ, agreed not only to condemn the “coups” against popular organizations, but also criticized the blockade of resources and projects as well as the removal of technical payments by the state. They denounced how the government is acting to neutralize the communities that continue to reject the TIPNIS highway, combining gifts and pressures. Silvia Rivera Cusicanqui, an anthropologist committed to the movements, profoundly reflected, “The different resistances do not feel part of the same [resistance]. Because what comes after the elections will be the razing of everything that resists. So activism must build bridges between different experiences, because they are defeating us everywhere.” And then she didn’t skimp on self-criticism: “There is a strong dependence on cooperation funds, which makes us vulnerable and takes away autonomy. Self-management, production and sale of crafts, food, [these things] should not have been abandoned, so that there will always be a self-managed wing in the organizations. That would allow us to overcome miserabilism, to stand against the state.” She emphasized that her horizon is not state-based. As the seminar closed, she gave a talk on “micropolitics and autonomy,” in which she highlighted how progressive governments embody a new colonialism that dominates the political spectrum and all expressions of collectivity. “The only space left for us is the micro, and from there we establish affinity communities that allow us to connect and link networks into a fabric capable of overcoming colonial practices.” Silvia Rivera is inspired by the Tambo Collective in La Paz, a cultural and political meeting place recovered by a group of young people. There, they organize fairs and exhibitions and run a garden to promote urban agriculture with the objective of promoting food self-sufficiency. All self-managed without external support. Sociologist Sarela Paz, also present in the meeting, was part of the team of advisors to the Unity Pact during the Constituent Assembly, and is now linked to the Bolivian Platform Against Climate Change. She argues that the MAS and the government are “an aggregation of local and regional interests which compromises with traditionally dominant sectors (read: agribusiness, mining or oil corporations),” which emerging social sectors with ethnic character join.14 According to Paz, this social grouping has “ambitions for development that are closest to the dynamics of regional and global capital, rather than alternative visions of development.” The legitimacy of the Evo Morales government facilitates the reproduction of “secular forms of economic coercion” with “democratic” and “popular” trimmings. She argues there were two stages in Evo’s government: the first was founded in the Unity Pact, a progressive agenda and a serious battle with the oligarchy of the eastern part of the country. The second government is different. “It’s a reflection of the breakdown of the popular coalition and the rise of a new power structure whose epicenter is partnership and coordination between eastern agribusiness sectors, oil sectors, and emerging sectors using ethnic rooting as a device for political mobilization.”15 This new alliance is that one that was massively blessed in the October 12 elections. It refers to the double standards of the great powers, but also the double discourse of those on the left. A critical view that Oscar Olivera, “water warrior” in 2000, shares. He was an organizer of the Integration from Below Seminar organize, and now agrees with Silvia Rivera on the need to work with ordinary people. He’s dedicated to environmental education for children in schools in peri-urban Cochabamba, from which he focuses on the recovery of collective subjects. Petropress No. 33, Cochabamba, agosto de 2014, p. 33. IBCE, Boletín Electrónico N° 245, 19 de agosto de 2013. Juan Manuel Karg, “Las diez claves del triunfo de Evo”, Le Monde Diplomatique N° 74, La Paz, octubre de 2014. Ministerio de Comunicación, “Construyendo la nueva Bolivia”, junio de 2014. La Razón, 30 de setiembre de 2013. Nueva Crónica y Buen Gobierno, N° 149, octubre de 2014, p. 4. Los dos primeros seminarios se realizaron en Venezuela en 2010 y 2011, a instancias de José Angel Quinteiro Weir y Carlos Walter Porto Gonçalves. El tercero se realizó en 2013 en Chile. CIDOB, San Cruz, 7 de junio de 2012. Servindi, 11 de diciembre de 2013. Sarela Paz, “Elecciones presidenciales y los rumbos del proceso de cambio”, Nueva Crónica y Buen Gobierno N° 149, octubre de 2014, p. 7.